6. May: We wake up very early at 4:40, since the bus to Sixaola is scheduled to leave at 6:15. 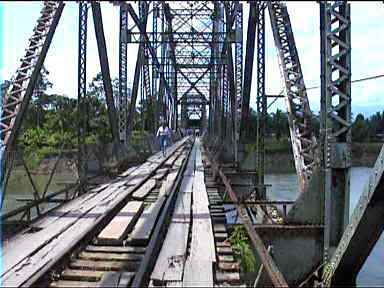 Today we plan to cross the border to Panama. The bus is late and arrives at 6:45. There are many revelers to be seen from last night's Reggae Festival, luckily they mostly heading towards Limon, which in the opposite direction to where we want to go. Our bus is exceedingly slow, I've never traveled in a bus this slow in my whole life. It stops every 100 meters or so, it seems, to pick up or unload some passenger or the other. It's is quite hot inside and opening the window a tad didn't help very much because the dusty road swept up clouds of dust inside every time the bus stopped. It was very tiring. The bus stops very abruptly and we are in Sixaola, the last stop. It is almost 9:30! By now the sun is out in full force and it is very hot outside as well. We need to take the bus to Changuinola are we look around to find it. A young man is walking around, persistently yelling 'Bocas del Toro', and we ignore him, but he doesn't let this deter him and he follows us around. He steers us towards a store to get stamps to cross the border, I go in, and am surprised to see that it is a general store. I'm not sure what to make of it, but since our 'guide' has left us, I decide to ask for the stamps at the counter. The lady presents 'Cruz Rojo' stamps! I immediately say 'sorry' and leave, thinking this is a scam to get us to support the Red Cross or something. It's all very confusing. Once we're outside, we're guided by the same guy to Costa Rican immigration. Just inside Panama, Salsa music is playing! Here, we find out that the 200ñ Cruz Rojo stamp is actually needed, so I'm back to the general store to humbly ask for the stamps again. We're lucky not to be Costa Rican, since they pay 50$ and a whole lot of Colones in all sorts of taxes in order to cross the border! The lady at CR immigration notes our names on a piece of paper and we continue on foot in the direction of Panama. 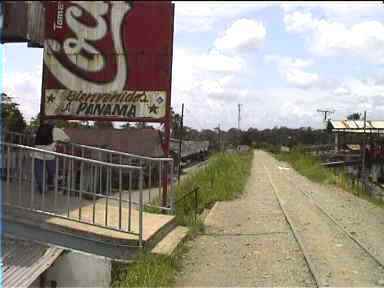 The path goes over an old pedestrian bridge, the other side of which ends in Panama. First we're greeted by Immigration, and then Customs, where the official takes a customary look in my small green rucksack. 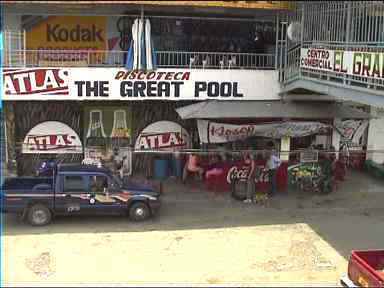 A young man is pestering me to go to Bocas all the time, he's offering us a Taxi for 15$ (the bus is 6$ per person), so we agree. We have two cokes, which are very cheap at 270ñ (we can still use Colones at the border. Panama has the 'Balboa' as currency, which is the same as the Dollar. Actually the bills are US dollars and the coins are a mixture of Balboas and US coins). The taxi is actually a pickup with two rows of seats, thankfully it has a/c. Our 'guide' accompanies us, another passenger or two get on, they leave at some point, and someone else gets in. 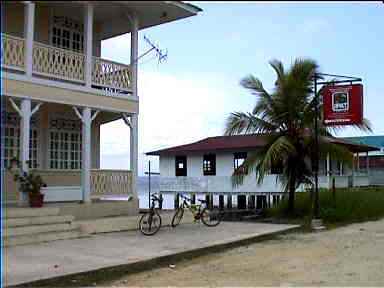 After several small detours and stops, we actually arrive in Almirante, Panama. During the trip, the driver panicked when he saw a police car and really quickly donned seat belts. Strict law enforcement here, apparently, quite a difference to Guatemala, for example. 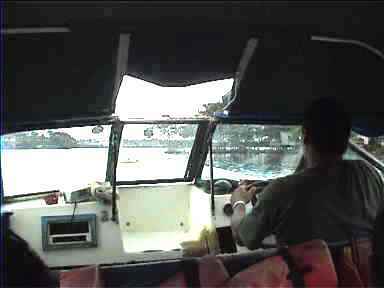 The taxi takes us to the place fro where to take the water taxi to Bocas and we wait for it to take us over (3$ each). 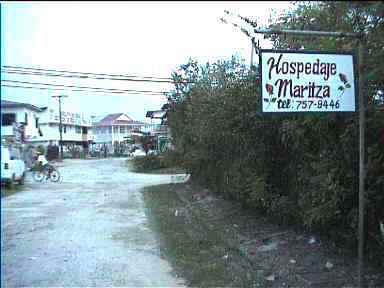 Again we are spoken to, this time by a boy who wants to recommend a hotel on Bocas (Hospedaje Maritza). We decide to play along. The boat has so many horsepower, 160? It sped in a straight line, and at incredible speed. 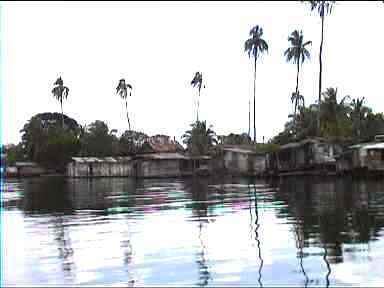 so we arrive in Bocas, the boy's friend is on the boat with us and takes us to the Hospedaje (which is actually just across the boat house and very visible from there). 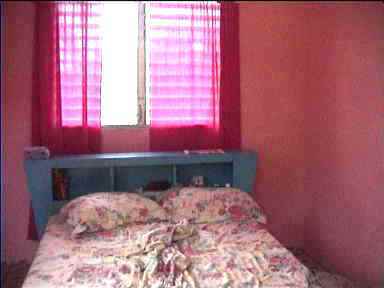 The rooms are 14$ a night, look clean and have bright pink walls. We take one. Our room is extremely PINK! We go our to town to find something for lunch, it is very hot, Annewien has Spaghetti, I go for pizza, it is not too good. 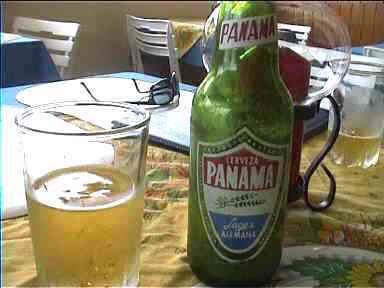 I try 'Panama' beer, recommended to us by the guy in the taxi, and it is quite good, although the bottles are very small. Much too small to quench the thirst of a hot summer day. Around 14:30-15:00 we're back at our room and we sell through the whole afternoon and night, we're so exhausted from the long trip and the heat! A fan keeps us more or less cool. A bar across the street blares music through the night, but I am too tired to care.